Succulents offer a low water alternative for the garden. Their varied textures, shapes and sizes will enhance the garden's design. Some succulents can contribute colorful flowers, while others add striking foliage or sculptural forms. They may be planted in decorative pots, borders, or in the hard-to-water corners of the garden. More than 60 plant families include plants with succulent characteristics, distributed among 300 genera and thousands of species. Read on to learn more about growing succulents. A succulent requires little or infrequent watering because it is able to store water. Succulents are divided into those that store water in their leaves, stems or roots. Succulents that store water in their leaves often have thick, fleshy leaves covered with a tough skin, such as aloe vera. Plants that store water in their trunk often have small branches and leaves. Cacti are examples of stem succulents: their leaves have been reduced to spines. Other plants store water in their leaves and stems, for example jade plants. Geophytes, plants that die back during part of the year to their bulbs, tuberous roots, corms or rhizomes, are also considered succulents. Amaryllis, bromeliads and hyacinths are example of this type of succulent. Epiphytes, plants that live in the air, unattached to the ground, are succulents that depend on their ability to store water obtained from rain and fog. 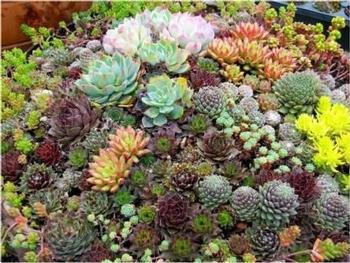 Some succulents are highly tolerant of salt and other chemicals and can live along the seacoast, in dry lakes or in highly polluted soil. Small succulents are effective as accents in the garden. Sedum or stonecrop may be used as edging or planted between paving stones or along footpaths. Sansevieria, otherwise known as snake plant or mother-in-law's tongue, is an undemanding plant, which tolerates low light, high or low heat, and erratic watering. Sansevieria thrives outdoors in a Mediterranean climate and its stiff straight leaves can add welcome contrast to soft, flowering borders. Kalanchoes are succulents with showy flowers that can add a bright splash to the drought-tolerant garden. Jade plants, also known as money plants because their thick leaves resemble coins, can be grown in pots near the front door of the house. According to practitioners of feng-shui, this welcoming plant in the entryway will bring prosperity to the homeowner. Yucca trees store water in their trunks. With their interesting forms, they may serve as point-of-interest specimen plants. Agave is another very effective specimen plant, which can grow to immense size in Mediterranean climates, ten feet across or more. Also called century plants, they look like enormous pieces of living sculpture and may thrive for many years. Eventually, the agave will produce a tall stalk with flowers. After the plant flowers once, it will die. Succulents tend to reproduce very easily: a stalk, or even a leaf of a plant, may root itself and grow into a new plant. You might want to ask a friend to give you a piece of one of their plants – or a “pup” – a small root bearing leaf cluster that will grow into a new plant after you pot it. For some pictures and descriptions, check out the following UC Marin Master Gardener Water-Wise Plant Selector Guide. Those with a further interest might check out the Cactus & Succulent Society of America.